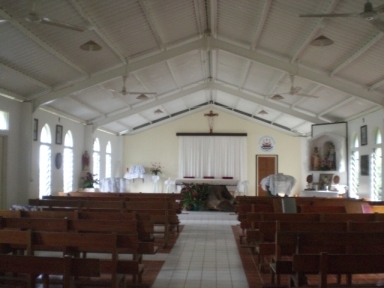 Niue - Catholic Church - Mission. The whole of Oceania had at first been entrusted by the Propaganda Fide to the Society of the Sacred Hearts of Jesus and Mary (1825); but the territory proving too large, the western portion was afterwards formed into a vicariate Apostolic and given to the Society of Mary (1836), Mgr Pompallier being appointed vicar Apostolic of Western Oceania. In 1842, the Propaganda created the vicariate Apostolic of Central Oceania, comprising New Caledonia, Tonga, Samoa and Fiji Islands. 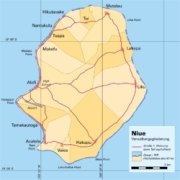 By a further subdivision, the vicariate included only the Tonga, the Wallis Islands, Futuna and Niuē. 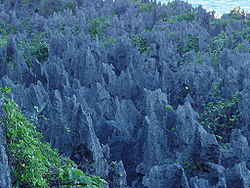 The Tonga Islands extend from 15° to 22° S. latitude and from 173° to 176° W. longitude. 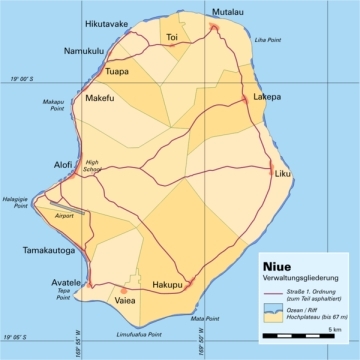 Niuē. is three hundred miles to the east. The Wallis Islands lie in 13° S. latitude and 178° W. longitude; Futuna, in 40° 14' S. latitude and 179° 33' W. longitude. 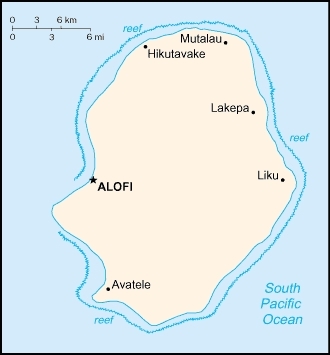 These archipelagos were divided among several more or less constitutional monarchies; the Kingdoms of Tonga, Niuē., Wallis and the two Kingdoms of Futuna. 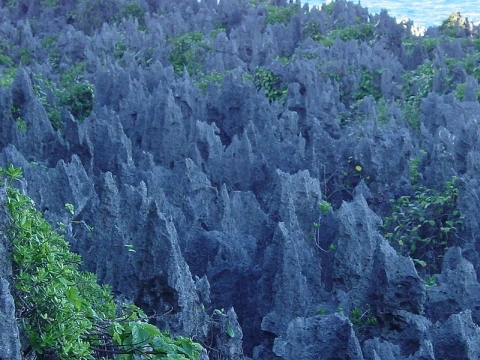 Tonga and Niuē. are under British protectorate, Wallis and Futuna, under French. By the early 20th century freedom of worship was theoretically recognised everywhere except in Niuē., which was exclusively Protestant; Wallis and Futuna were entirely Catholic. In Tonga there were Catholics, Methodists belonging to the Sydney conference, independent Methodists forming a national Church, some Anglicans, Adventists and Mormons. The total population was 34,000, with 9200 Catholics. There were 35 Catholic churches; 21 European and 1 native Marist priests, and 3 native secular priests; 28 schools with 2039 children; 2 colleges; 1 seminary. The establishments for girls were under the care of 52 Sisters of the Third Order of Mary. The boys' schools were conducted by native lay teachers; the colleges and the seminary by priests. The islands were divided into districts, with resident missionaries assembling every month for an ecclesiastical conference. There were annual retreats for the priests, for the sisters and for the catechists, besides general retreats for the faithful about every two years. In each village there was a sodality of men (Kan Apositolo) and another of women (Fakafeao). The yearly number of baptisms averaged 310; of marriages, 105. Mgr Bataillon was the first vicar Apostolic, succeeded by Mgr. Lamaze, at whose death (1906) succeeded his coadjutor, Mgr Amand Olier, S.M., from (1910) vicar Apostolic. The vicariate has given to the Church the proto-martyr of Oceania, Bl. P. Chanel. The Catholic Mission Community and New Zealand High Commissioner entertains our Tupuna. The New Zealand High Commissioner has been hosting the Tupuna Christmas function at the New Zealand Official Residence at Tapeu since December 2004 and enthusiastically supported the Catholic Mission Community in this annual event. "The New Zealand High Commission is happy to provide the venue, and lend support to the Catholic Mission to facilitate the holding of this function in honour of Niue's senior citizens," said HE Brian Smythe in welcoming his guests. Not all of Niue's resident Tupuna managed to attend the function this year, some are away in New Zealand on medical referral, others have gone early for Christmas with their children and avoid the last minute rush while the remainder probably stayed home for lack of suitable transport or have passed away since December last year. The annual get together is a popular event, more so with our Tupuna who have spent most of their time by themselves or with their families in the villages, enjoying the familiar environs and happy to be in their own homes where they have spent most of their lives. HE Smythe offered a sensible solution in view of proposed plans to expand the facilities at Niue Foou Hospital for those in need of 24 hour care. "…to my mind a better course might be to carry care out to the villages so that people can stay in their own home as long as possible to be with their children and grand children around them." The Catholic Mission spokesperson, Mr Sefeti congratulated the caregivers for continuing to care and support their Tupuna in their homes and for bringing them to this special Christmas event where they socialised with one another, sang Christmas Carols together as well as the songs of their time. He also thanked the New Zealand High Commissioner for his continued patronage and allowing our Tupuna an opportunity to visit the 'Tapeu Residence'. For the present Tupuna it was a rare honour to be invited to the ‘Residence’ when they were young and many had little opportunity to view it at close quarters until the former High Commissioner, Sandra Lee Vercoe in 2004 offered the use of the venue for the annual Christmas Party. While millions of visitors get to wander through India’s famous Taj Mahal, only the privileged few locals ever got close enough let alone be admitted inside the 'Tapeu Residence as it was then commonly known. Thankfully HE Smythe was more than happy to open up the doors and invite his guests for a closer encounter but our Tupuna while tempted to accept respectfully declined knowing the required traditional protocol that is associated with the privacy of the New Zealand High Commissioner's home. It is amazing to know that the 20 or so 75 year old Tupuna who attended this year's function their combined ages totaled 1,500 years – about as long ago as Niue was permanently settled by our ancestors and began to build a nation that we today enjoy and proud to call home. Equally as amazing is that among those present were former doctors, nurses teachers and midwives, planters and fishermen, hunters and gatherers, composers and storytellers, pastors and deacons, warriors of the sunrise and most important repository of our unique heritage, every single one of them, flag bearers of our Taoga. And you should have heard them sing – amazing! 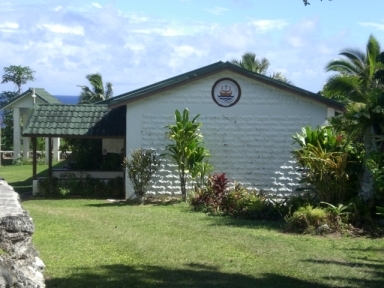 Diocese of Rarotonga (Cook Islands) - suffragan see of Suva (Fiji) has ecclesiastical jurisdiction over the Parish in Niue.